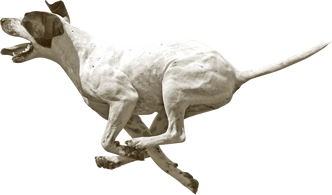 The Scent-Cone is the secret to understanding what dynamic makes hunting dogs classier and more accomplished in hunting and handling game. Most of the great bird dog trainers/handlers I knew grew up with a pack of hounds. I’ll name four: Clyde Morton, Paul Walker, Er Shelley, Bob Armstrong. They learned most about scent from running foxhounds. One of these, Er Shelley even took a pack of hounds to track game when he traveled to Africa. Imagine that the concentration of scent effluvium is weaker at the outside of the cone (which is in actuality three dimensional like a funnel). Of course, the cone or funnel is extremely unstable, subject to breezes, dust-infusions, temperatures and barometric pressure. Thus, while essentially narrow where it is laid down, and broadening out, it floats, billows and shrinks and wafts around without any pattern but its very own. A hound with a less precisely sensitive nose, will need to get closer and closer to the middle of the scent aura. He cannot pick up the outlying faint impression. Thus, when the quarry moves, backtracks or makes any other sudden adjustment, a poor hound will go babbling off and lose the scent trail immediately; while the hound with sound scent acuity is able to track on the very edge or verge of the scent cone, and thus, will not miss any abrupt redirection by the quarry. Similarly, bird dog Alpha, with an exponentially better nose than bird Dog Omega, will be able to learn how to strengthen the scent excitement appropriately without putting the birds in the air untowardly. This, of course, entails intelligence/teachability. Bird dog Omega, because of his inferior “nose” may NEVER be able to learn this lesson which transforms him into a class performer, rather than a foot-scent-tracker, teachable or not. Following this corollary, bird dog Alpha, with superior scenting ability will be able to scent and properly locate game from a ridge or hillside in light breeze, while Omega must be IN the valley, or arroyo to have a chance to locate the game there by tracking. Experience and correction time, and a lot of patience with the young pup and derby showing exceptional scenting ability will pay off. The best youngsters will learn to handle critical scent problems in direct proportion to the number of times they learn to stand and see birds fly, and learn how to get their mouths on a bird. They will also learn to slow their pace at the right place at the edge or “mouth” of the cone and find the best scenting area to do their job. Of course, this accounts for the specialty dogs that seem to better handle running upland game: (ruffed grouse, pheasant, Huns, Valley and scaled quail and chukar) in various environments. It also accounts for the brilliance some dogs show in rounding up a covey and/or relocating while some dogs just have an unproductive or fail to relocate. Some judges who have never hunted and shot wild upland game in dense cover will fault swiftly-adjusting dogs by accusing them of blinking. This is viewed as sad and ignorant by anyone who has foot-hunted or check-corded dogs and knows about the scent cone and the way the sharp dog exploits it. Scent cones are not always the same shape and a veteran hunter will know this and recognize his dog’s empirical mastery. My Great Uncle Roy Wilson was a market hunter. He could almost predict a dog’s every step in heavy cover. My grouse hunting taught me — where it had only been a glimmer of an impression when I was a young quail-killer — that upland game birds learn from day one to always keep cover or protection between them and a predator or hunter if they are going to survive. I spent considerable time trying to shoot grouse through tree trunks. Flight-conditioned, incubator-pen-raised birds do not have this stratagem, and do not live long enough to develop it. The liberated pen birds of my experience, usually fly straight up and much farther (ironically) than wild birds, before they light. Native quail, as familiar with surroundings as Br’er Rabbit and his briar patch, “know” a nearby copse. Their ground pattern is also quite different from wild birds. They are less likely to know the uses of cover, the importance of cover or its relative safety and non-safety. This accounts for the comparable facility with which a young dog will handle liberated birds. They have no tricks that require relocation in a chancy covert. Then, of course, some dogs are born with more native intelligence than others. Intelligence is the INHERENT ability to use new information to its best advantage. This means, for a wild natural creature, to utilize every threat for survival, personal and species survival. This kind of intelligence is atavistic and instinctual but still is intelligence, because it is archived and used again and again. The next level of intelligence is to build on this natural information to evolve a habit of choices: “X” behavior results in pleasure, freedom, satiation and “Z” activity results in discomfort, hunger, loneliness or separation and less “joy” or “reward”. Extension of these choices and the extent to which the dog exploits them thereby pleasing the “pack” leader (read owner, trainer, handler, scout) enabling the dog to get more opportunities to find, retrieve, mouth, and sometimes even DEVOUR the quarry (under selective supervision). But, praise and demonstrated approval are the Baked Alaska dessert, the goal culmination. Acknowledgment and response to praise is the hook on which intelligence growth hangs. Following this intelligence development to the use of what I have called the scent cone is not a plumb-line trek. Sometimes we believe the dog’s scenting ability improves like a light bulb being clicked on. This usually means the trainer as well as the dog has exploited a new lesson. All lessons are not planned. The richest ones are revelations…awakenings…epiphanies. Dogs trained on pigeons and pen raised birds will seem rather lost for a while when they are required to work wild, running upland game. Most of the wild game away from a very few southern quail plantation milieus are runners to begin with. Many run in the extreme, so to speak. That means a dog that can add two and two together and get four in a comparatively brief exposure to them is mastering the vagaries of the scent cone….OR one that grinds away until he/she learns how to relocate and “nail” them to the ground expertly without flushing them. Somehow, the game just stops and huddles as a result of an educated movement that no human can predict or develop in a dog. It is just a craft, learned. The first of the above is, I think, more intelligent. All the other wild upland game birds run to some extent. The pinnated grouse, or Sharptail that we call prairie chicken nowadays, probably run the least around Summer midday, but that is because cover is scarce in its habitat, and it uses as much of the cover as it can to put between itself and the dog/man/predator. Then, Huns are notorious track stars. Chukar, pheasant and ruffed grouse ambulate considerably…especially after your dog has established point. Before this, and certainly after this, is where the dogs use of the scope of the scent cone is important. If the dog’s nose is not up to snuff (no pun intended) he will probably have outrun his nose, needing the strong pull of the foot/body scent to make the original location. There are also too many times when a dog’s nose and brain are not engaged at the same time and they just pass by the scent. Close observation and “knowing the dog” can tip off a handler. If, after getting a startling whiff of game, the dog with super acuity has sensibly and sensitively depended on the faint outer edges of the scent cone he will begin to exhibit indicative signs, change of gait, static alertness, “making game” and then pointing. If some time elapses before help arrives, the dog must relocate running quarry. In doing so, again, if the dog must have foot-body scent to make the relocation, there is only about a one out of three chance he will be successful without collision and disaster. A dog with superior olfactory acuity will identify his “mastery” by relocating precisely and swiftly most of the time. Experience will vastly improve the celerity of this performance. IF, that is, he has developed special intelligence through experience, failure, success and reward. So, in my view, a really brilliant class bird-handling dog needs good breeding for excellent nose, native intelligence that archives lessons, and a lot of heart. Oh…and luck in the judges is final twist in the Rubik’s cube, here. And, Luck is the residue of preparation (by the judge) as Branch Rickey famously said.